As we reviewed data from last year, we noticed a trend that was concerning. The number of students who were sent to the office for discipline referrals increased by 41% during the 2017-2018 school year. Because it is important to have a school environment that is conducive to learning, resolving this issue is a top priority for the 2018-2019 school year. A committee was formed to investigate ways that our school environment can promote good behavior and reduce the number of students who are not meeting expectations. The committee was made up of Mrs. Lynch (MS Science), Mr. Maisch (6 th Grade), Mrs. Skarolid (1 st Grade) Mrs. Vevle (Technology), Ms. Chabot (Spanish), Ms. Reardon (Special Education), Mrs. Snodgrass (School Counselor), Mr. Wakefield (Dean of Students), Mrs. Hanson (Behavior Interventionist) and Dr. Wedlund (Superintendent). Over the last 6 months, members of the committee have conducted site visits to see behavior programs at other schools, attended training, and held numerous meetings. This week, the committee trained the Kaleidoscope staff on a behavior program that we believe will have a huge, positive impact on the climate at KCS. "Be Ready, Be Respectful, Be Safe" are phrases that will be used to help organize student expectations. The new behavior program will still be known as the PRIDE program, and it will maintain a focus on teaching the students what is expected of them during each part of their school day. 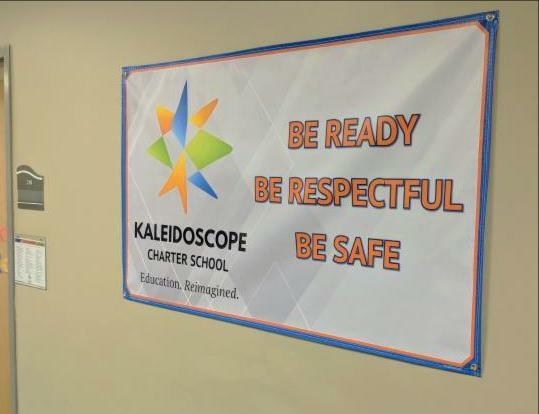 The expectations were placed on a matrix and organized around the key ideas that students should always “Be Ready, Be Respectful and Be Safe.” When you account for core academic classes, specials, lunch and recess, a typical elementary student at KCS will be supervised by as many as 12 adults throughout the week. This matrix is a tool to create consistent and common language among our staff so that students receive the same message regardless of which staff member they are with. You can help us promote these expectations by reminding students to “Be Ready, Be Respectful and Be Safe” each day when they go to school. The behavior matrix identifies behaviors expectations that should be met in 8 areas of the school. In addition to having a common language for teaching students what is expected of them, our staff will now follow consistent procedures for addressing inappropriate behaviors. All student behaviors will be labeled as either major or minor behaviors. Major behaviors will always be sent to the office to be addressed by our Dean of Students. Parents will be notified when a major behavior occurs. Each area of our building will have a “Take a Break” location which will be the 2 nd Step of the process. Whether it is a quiet area of a classroom, or a designated curb to sit on in the playground, the “Take a Break” areas are designed to allow students to reflect on their behavior and get themselves back under control before reentering activities with their peers. The "2nd Step" in addressing minor student behaviors will be to go to the take-a-break area. 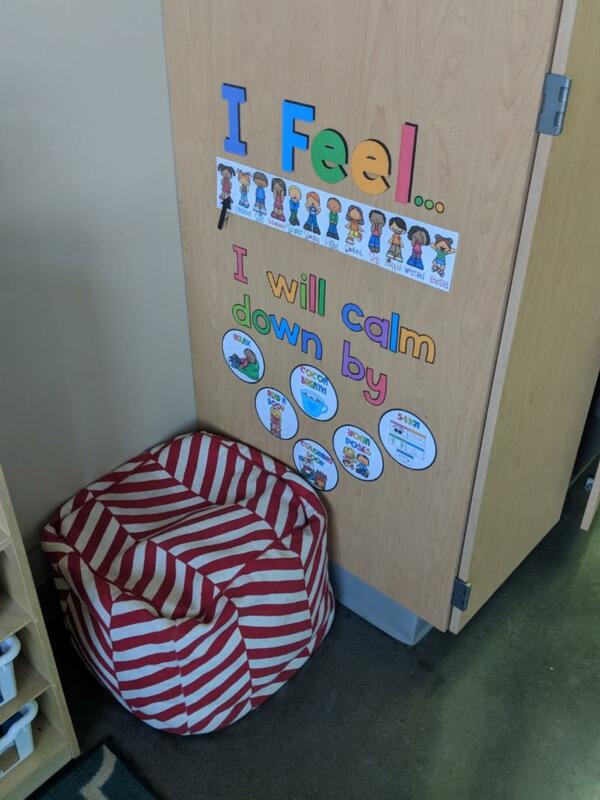 The image above is a take-a-break area in a 1st grade classroom where students can go to reflect on their behavior before rejoining their classmates. If the behavior continues to occur, the staff member will move on to the 3 rdstep and create a referral to have the student leave the room. 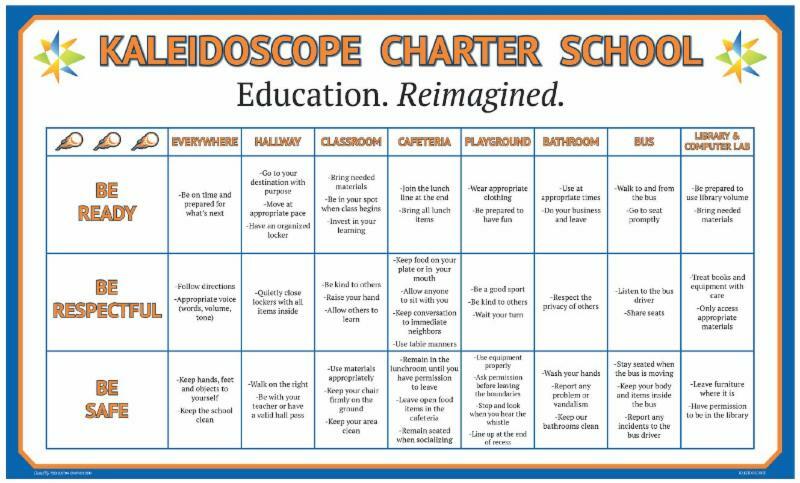 Students in Kindergarten through 8 th grade will go to the “Stop and Think” room which is staffed by Kaleidoscope’s Behavior Interventionist. The goal of the “Stop and Think” room is to process the behavior with the students and prepare them to return to their regular classroom setting. Students in 9 th through 12 th grade will go to the office for the 3 rd Step. When students reach the 3 rd Step, their referral will be sent home for to parents to sign and return. This is not a punitive step, but one we want to take to make you aware of the behavior that has occurred. While the referral will be shared with you, we want to be clear that the Stop and Think room is for minor offenses. 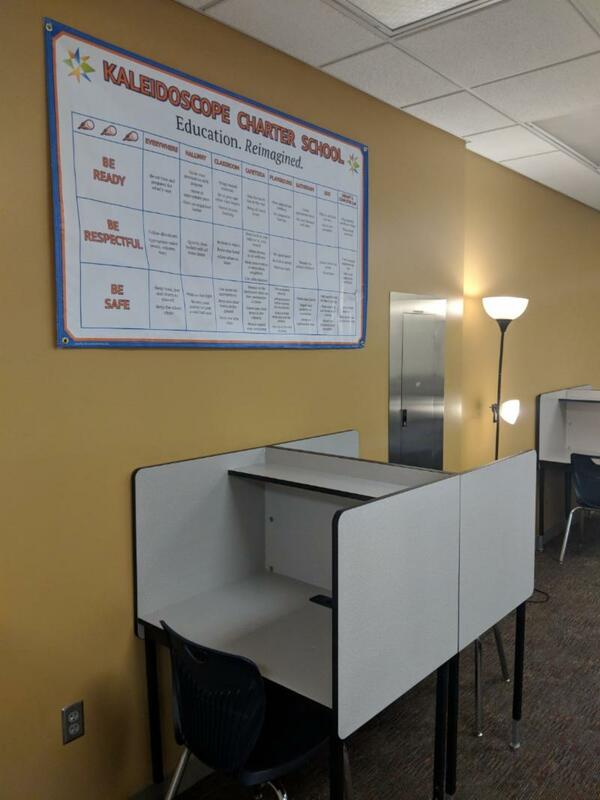 We anticipate that almost all students will be in the Stop and Think room at least once during the school year. Our focus with the stop and think room is not to punish students for their behavior but to teach students how to meet our expectations. We would encourage you to take a similar approach when addressing the referral. The third time a student does not meet behavior expectations they will move from the classroom to the Stop and Think Room. There they will work with our behavior interventionist until they are able to successfully return. For the past couple of years, our school has had an Office/Discipline Referral Committee which meets on Friday mornings. This committee will review the referrals to the Stop and Think room each week looking for students who have habitual behaviors that need further interventions to address. Your child simply being sent to the Stop and Think Room should not cause a red flag of concern for you. A member of the Office/Discipline Referral Committee will reach out to you if your child’s minor behaviors begin to stray from the norm to discuss next steps which may be taken. We are very excited about the potential of this program. Schools that have implemented similar programs have reported not only significant reductions in referrals, but also huge improvements to their school climate. We look forward to seeing you at open house. As always, please feel to let us know if you have any questions.